Baked Cake Donuts have a hint of nutmeg and a dense, cakey, texture. The recipe halves quite easily if you want to make 6. To make 12 you can bake one batch at a time or use 2 pans. Preheat oven to 425°F. Spray a doughnut pan with nonstick cooking spray. Sift the cake flour, sugar, baking powder, nutmeg and salt into a mixing bowl. Make a well in the center of the dry ingredients and add the milk, eggs and butter. Beat with a scraper or spoon until combined. Spoon batter into doughnut pan cavities. You'll have enough for 12 cavities and will need to do this in two batches. Bake about 9 minutes or until the tops of the doughnuts spring back when touched. Let cool in pan 4-5 minutes before removing. Repeat using remaining batter. 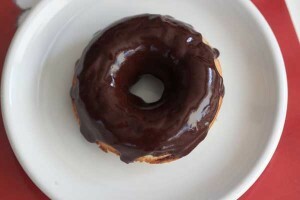 While doughnuts are cooling, make the chocolate glaze. Glaze: In a 2 cup microwave-safe glass measuring cup (e.g. a Pyrex cup), mix the chocolate chips, butter and corn syrup. Microwave at 50% power stirring every 30 seconds until mixture is melted and smooth. Add hot water to thin. Spoon over doughnuts. Notes: For vanilla glaze, start with 2 teaspoons of butter, 2/3 cup confectioners’ sugar, a dash of vanilla and milk as needed. Melt the butter in a 2 cup microwave safe measuring cup. Stir in the sugar until thick, then add vanilla and enough milk (start with a teaspoon) to make a smooth, pourable or spoonable icing.